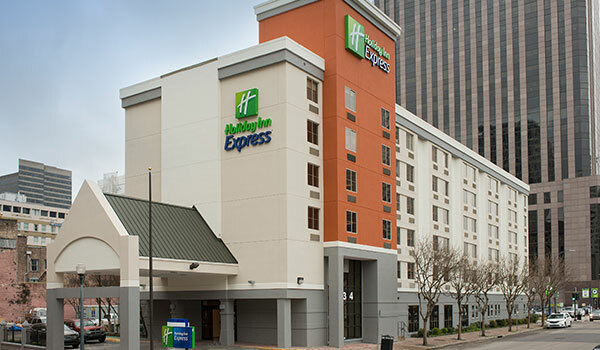 The Holiday Inn Express is located in the business district of downtown New Orleans, LA, just 2 blocks from the Mercedes Benz Superdome, the Smoothie King Arena and within walking distance to nearly every site you want to visit while in New Orleans. Nearby famous attractions include Bourbon Street, National World War II Museum, Outlet Collection Shopping Mall and the Children's Museum, located just a short walk away. Our rooms offer the new Formula Blue Smart Travel Design and the hotel offers a complimentary full breakfast buffet every morning. Join us in the Big Easy and experience Lagniappe! It's more than you expect. The Staybridge Suites New Orleans Downtown French Quarter is located in the central business district of downtown on the door steps of the infamous French Quarter and conveniently situated a mere six blocks from the New Orleans Morial Convention Center, one block from Harrah's Casino and both the Mercedes Benz Superdome and New Orleans Arena are within easy walking distance. Additional local attractions include world renown Bourbon Street, New Orleans National World War II Museum, Children's Museum, the Audubon Aquarium, Butterfly Garden, Zoo, and Insectarium. While enjoying all that New Orleans has to offer you can rest easy in the comforts of our large rooms / suites that include full kitchens and outfitted with either a King size or two Double size beds. We also offer a daily complimentary full breakfast buffet, complimentary PM Social Mon thru Wed evenings with light dinner items along with beer, wine & sodas. For those staying a little longer we also provide free on site laundry facilities. When it's time to cool off and relax take a dip in our outdoor pool and lounge in our cozy courtyard area. See you soon and experience Lagniappe! 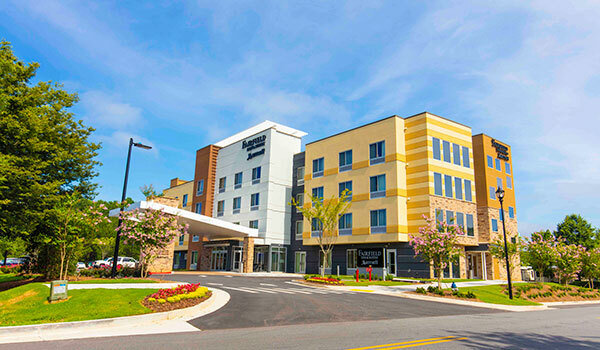 At the brand-new Fairfield Inn & Suites Atlanta Woodstock, you'll never skip a beat. 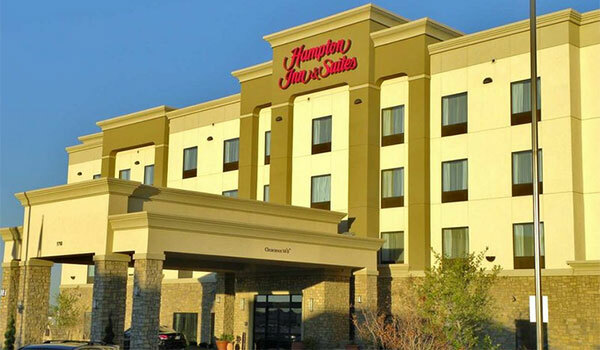 Located off Interstate 75 and Interstate 575, our hotel provides convenient access to popular local destinations including The Outlet Shoppes at Atlanta, Dixie Speedway and Kennesaw State University. There are plenty of restaurants and entertainment minutes away in Woodstock's historic downtown. Conveniently located between downtown Dallas and Arlington, the Hampton Inn & Suites Dallas/Cockrell Hill I-30 sits in the middle of a variety of outdoor recreation, amusement parks and cultural attractions including the Museum of American Railroad, the Dallas Arts District, Sixth Floor Museum at Dealey Plaza, Six Flags Harbor and the streets of Greenville Avenue, which features boutiques, eclectic shops, live entertainment and restaurants. The hotel offers guest rooms and accessible rooms with one king-sized bed and two queen-sized bed options and each room features a 37-inch flat-screen TV with cable, a work desk with an adjustable lamp, lap desk, free remote printing and free internet access. Also featured are pool, 24-hour fitness center, a business and free hot breakfast. 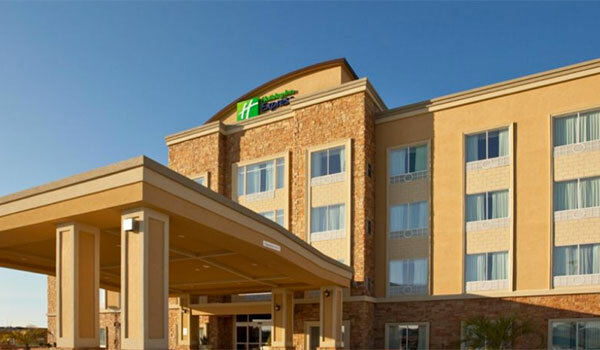 The Hampton Inn Atlanta/Peachtree City is an inviting hotel in the south Atlanta suburb of Peachtree City. 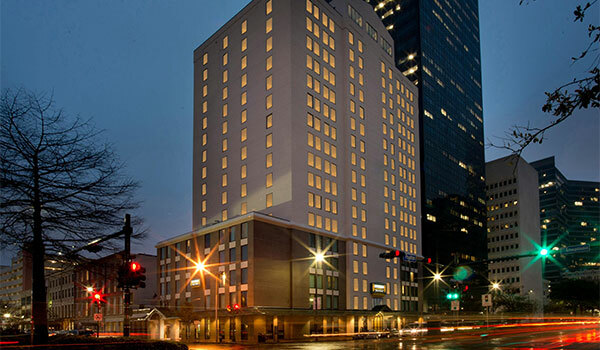 Our hotel is 25 miles from downtown Atlanta and 20 minutes from Hartsfield-Jackson Atlanta International Airport. Built around three championship golf courses, Peachtree City is also home to a baseball and soccer complex, a tennis center and over 100 miles of walking, jogging, cycling, and 90 miles of golf cart paths. Go sailing, canoeing, fishing, or swimming at Lake Peachtree and Lake Kedron. Let the kids try the BMX track or visit family-friendly attractions in Atlanta. The Avenue offers designer boutiques and specialty stores for a memorable shopping experience. Enjoy a show at the Frederick Brown Jr. Amphitheater, only three miles from our Peachtree City hotel. The corporate offices of NCR, Panasonic, TDK, KIEWIT, Gardner Denver, Pavestone, World Airways and others are minutes away. 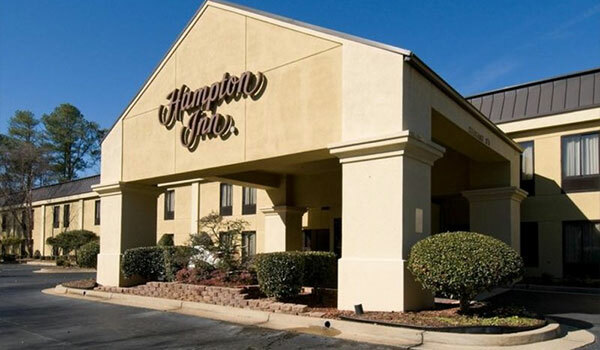 The Hampton Inn Atlanta/Woodstock is located at the junction of I-575 and Highway 92 in Woodstock just north of downtown Atlanta. Historic downtown Woodstock is a district of paved sidewalks and buildings dating back to 1879. Visit Dean's Store, now a visitor's center, museum and art gallery, to learn about our town's history or simply meet local residents. Explore Civil War history at the Kennesaw Mountain National Battlefield Park, only nine miles away. Take a short drive to Town Center at Cobb Mall, where you can browse in over 160 department stores and specialty shops. Enjoy a day of family fun on water slides at Six Flags® White Water Park, only 13 miles away. Woodstock First Baptist Church is also minutes from our hotel. Plan a day trip to downtown Atlanta, less than 30 miles from our hotel in Woodstock, GA, to explore diverse attractions such as the World of Coca Cola, CNN Center and the Georgia Aquarium. Located just off I-35 and only 15 minutes from downtown Austin, the Holiday Inn Express & Suites Austin South provides a relaxing atmosphere while at the same time providing quick access to many of Austin's popular attractions including the Hyde Park Theatre and the legendary 6th Street restaurant, bar and live music scene. The hotel offers an array of extra amenities including a relaxing, outdoor pool and a 24-hour fitness center. Its Express Start breakfast bar offers tasty hot items, fruit and pastries and its spacious meeting room is a versatile facility with accommodations for 52 guests. 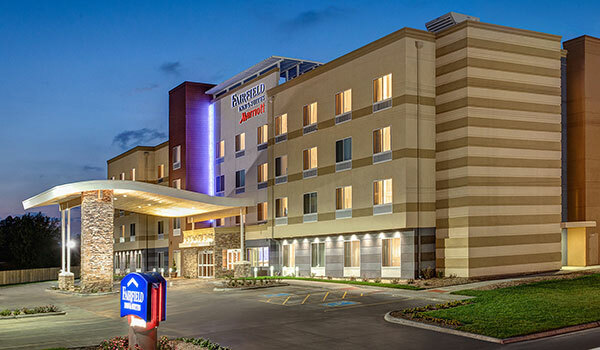 The new Fairfield Inn & Suites in Columbus Indiana will feature 96 rooms and suites with 3125 square feet of meeting space located within minutes to downtown and the Edinburg Premium outlets. Known for its extraordinary architecture, the city of Columbus is within the Indianapolis/Louisville/Cincinnati triangle, providing easy access to big city action. 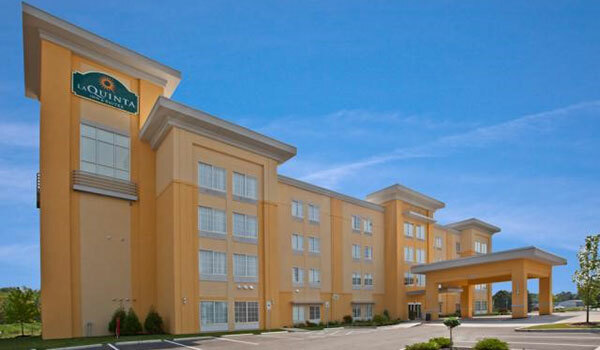 The hotel is conveniently located just off I-65, and is close to Enkei, Cummins, Toyota, NTN, Faurecia, Impact Forge, Sunright America, Columbus Regional Hospital, and Camp Atterbury Military training center. 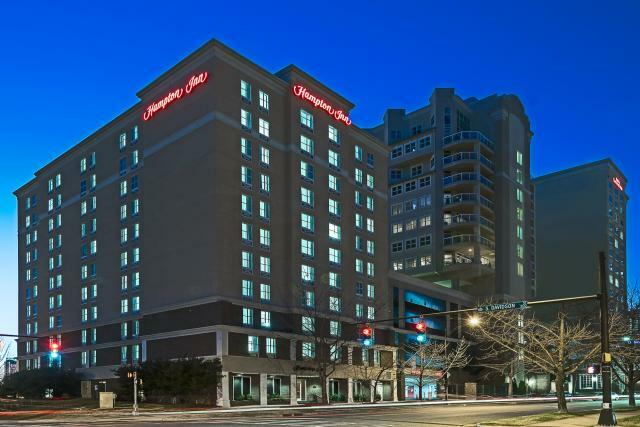 Welcome to the Hampton Inn Charlotte-Uptown hotel, conveniently located in the heart of all that Charlotte, NC has to offer. Nearby attractions include Time Warner Cable Arena, Bank of America Stadium, Charlotte Convention Center and NASCAR Hall of Fame. Our hotel in Charlotte Uptown is also close to a number of businesses, including Bank of America, BB&T and Wells Fargo headquarters. Use the free hotel shuttle bus service within a three-mile radius to these and other destinations. Explore amazing restaurants, museums, sporting venues and shopping in Charlotte, the Queen City. 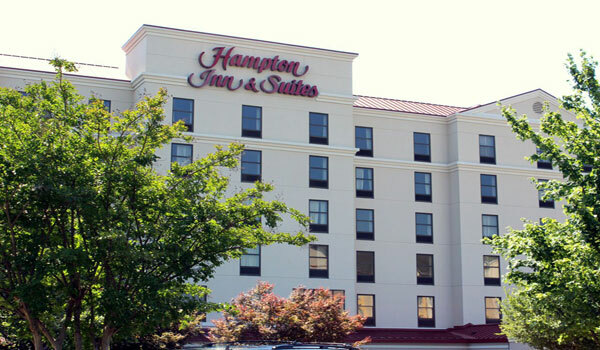 The Hampton Inn & Suites Concord/Charlotte hotel is near racing destinations, shopping and restaurants. Discover the convenient location of our hotel in Concord, NC, less than one mile from area racing venues and Concord Mills Mall. Visit the Charlotte Motor Speedway or the ZMax Drag Strip. Go to racing school at the Richard Petty Driving Experience or tour the Hendrick Motorsports Museum. After a day of racing or meetings, unwind by our outdoor pool and heated spa, re-energize in our fitness center, or fall asleep amid the crisp linens on a clean and fresh Hampton bed® at our hotel in Concord, NC. Welcome to Home2 Suites by Hilton-Conway, AR. Set off I-40, our extended-stay hotel is a quick walk to Conway Commons shops and restaurants, and 2 miles from Lewis Crossing retail stores and other day-to-day conveniences. 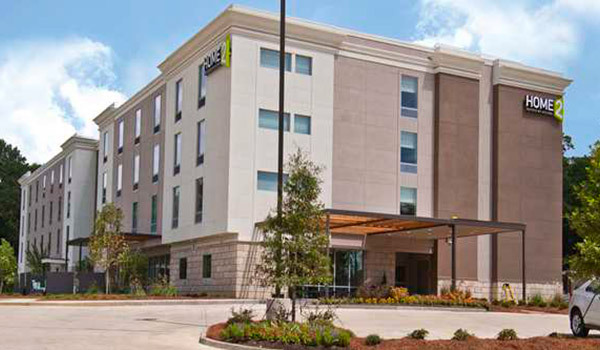 The Home 2 Suites by Hilton in Conway is less than 3 miles from major Conway corporations such as Snap-On, Kimberly-Clark and other Fortune 500 companies. Just minutes from the University of Central Arkansas and Central Baptist College we are a perfect location for families traveling to Conway, AR. Make yourself at home in a suite that's stylish and smartly designed. Each suite has a full kitchen with microwave, dishwasher, full-size refrigerator, coffeemaker, cooking utensils and silverware. The ‘Working Wall' - combined kitchen, workspace and storage areas - offers the flexibility you need, and the living area has movable furniture to arrange as you like. Curl up on the sofa and watch the 42-inch HDTV, and enjoy free WiFi for your devices. We also welcome pets at our Conway hotel. Located right off Interstate 65 near Downtown Columbus and minutes from Edinburg Premium Outlets. 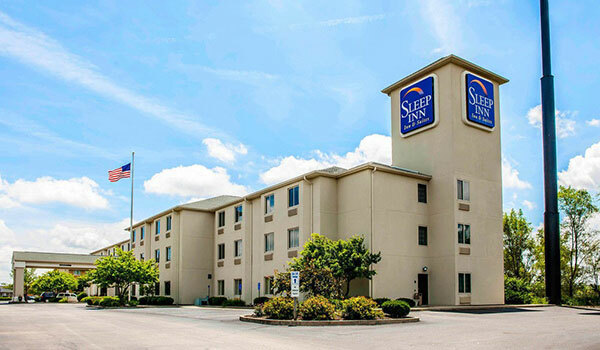 Whether you are in town for pleasure or business, the Sleep Inn Columbus offers great amenities at an affordable price. While in town take a quick trip to visit Cincinnati, Louisville, and Indianapolis all within 45 minutes of the hotel. 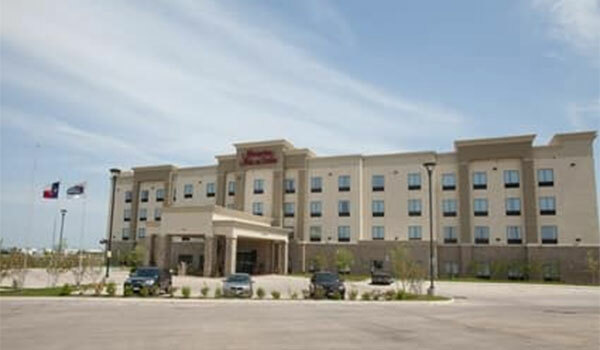 Award-winning hotel located in South Central Indiana right off Interstate 65. With spacious rooms and modern comforts, the LaQuinta Columbus is a perfect location to unwind. While in town, take a quick trip to visit Cincinnati, Louisville, and Indianapolis all within 45 minutes of the hotel.